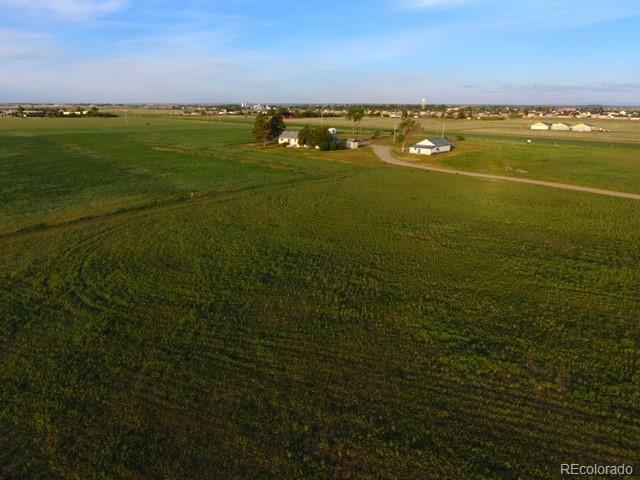 ~*~PRICE IMPROVEMENT- 75+ Acres, Ag Zoned, NO HOA / NO Covenants. *247.9 Acre feet of Final Permitted (adjudicated) Water Rights, 1- Acre foot of water =325,851 gallons "Annually". Easy 20 Minute Commute to Metro area. Allocations per Aquifer & Alluvium---Alluvium Water Rights.=205-Acre ft, Laramie-Fox Hills =13 Acre ft. , Arapahoe =22.4 Acre ft. , Denver=7.5 Acre ft. *The (3)- Deep water Well Permits Allocation use is -Commercial, Domestic, Irrigation, Stock watering. * This 5-Bed/1-Bath Spacious Home with hard wood floors, Bay windows, walk out Basement with Separate Domestic water well, (2)- Car Detached Garage, - 48' X 26' (2)-Bay + Storage SHOP, Complete side roll Irrigation system with Natural Gas reciprocating motor PUMP. The potential of this Unique property is Unlimited- Commercial & Residential development, Family farm, Organic farm, Etc. Water Rights permit numbers & all Information in Supplements.